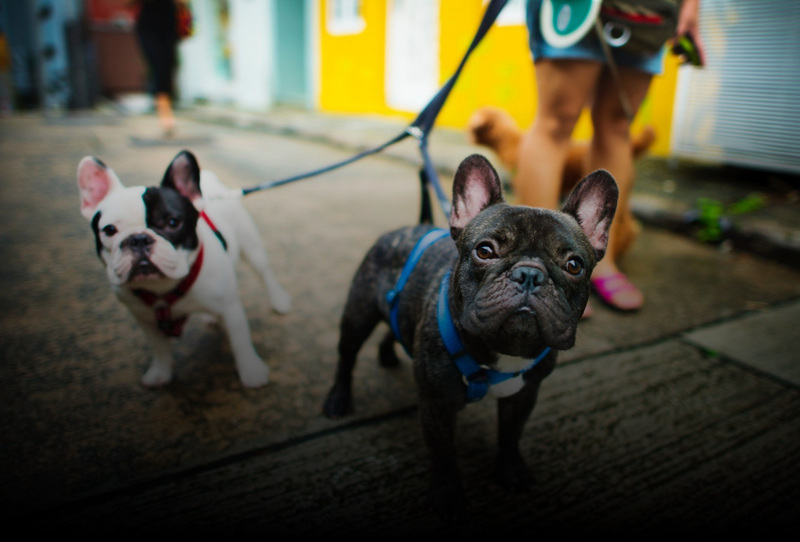 CityPups is a dog adoption app that helps city-dwellers find a dog that fits their lifestyle, living space, and personality. CityPups asks a few questions to new users in the onboarding process. 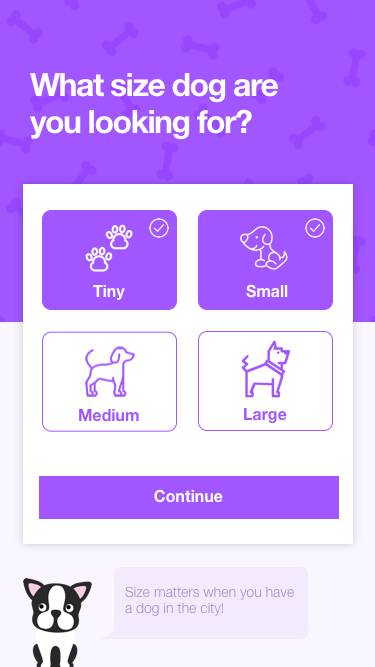 These questions help match users with dogs that may be a great fit for them to adopt. 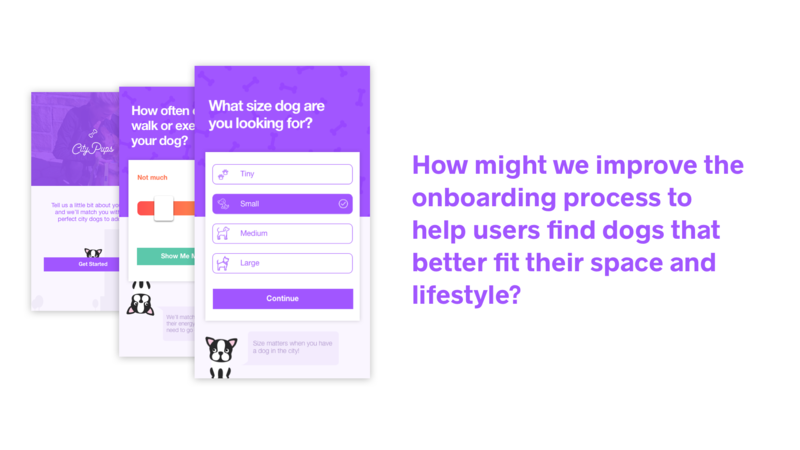 Watch a recorded user test of the onboarding process for CityPups, and re-design the experience based on research insights. The project brief included an in-person, moderated user test with Chelsea, a city-dweller looking to adopt a puppy. Chelsea walked through the onboarding process, and gave feedback about her experience. Although Chelsea's expectations were met with regards to how the experience was presented, the questions themselves rarely gave enough detail for Chelsea to answer accurately. Because of this, Chelsea did not feel confident that the dogs presented after the onboarding experience would be a good fit for her. 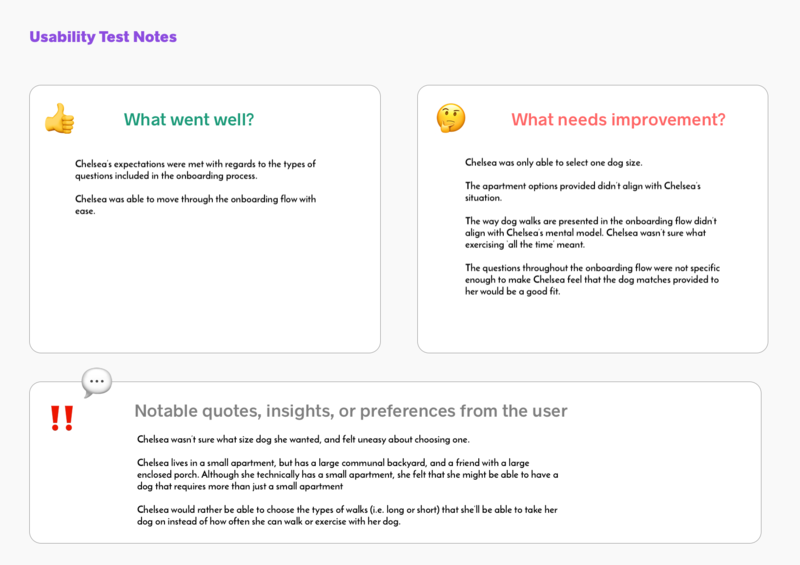 After collecting insights from the usability test, I sketched out possible ideas on how to improve the onboarding process. The purpose of these sketches was to help iterate through many design options quickly. I choose screens that performed poorly in the usability study, and sketched 2 possible solutions for each. I made all questions multi-select, clarified instructions, and added additional options where needed. After sketching, I started designing the final screens in Sketch. I followed the established style guide as a base for the CityPups experience. I focused on keeping the experience fresh and entertaining with the intention of keeping the user engaged throughout the onboarding process. I did this by using larger iconography, clear tap targets, and maintaining a sense of excitement throughout. We learned a great deal of information from the usability test included in the project brief. 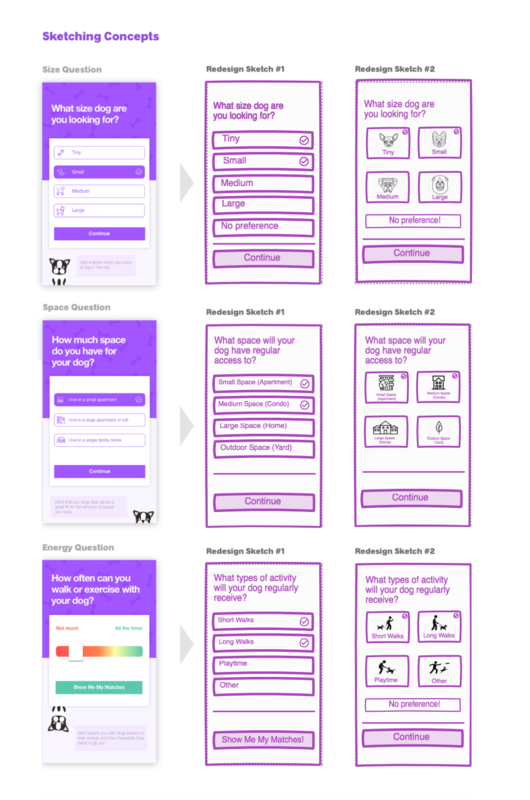 The onboarding process was missing several basic usability principles that we included in the updated design. By sketching a couple options for the problematic pages, I was able to settle on a clear direction for the final screens. Next, we will need to create a simple prototype out of these screens and test our assumptions.